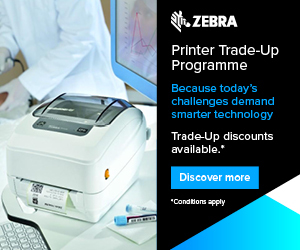 Today's challenges demand smarter technology - and that's why we have paired up with Zebra's printer trade-up programme to give you the best discounts on the latest technology. Thanks to this initiative you will no longer have to continue risking the network security issues and performance restrictions of older printers - we're giving you a chance to upgrade your printers to the newest models at a largely discounted cost (up to 58.5% off list price). This campaign - ending 31st May 2019 - will allow you to trade in any make or model printer (not just Zebra) for one of Zebra's latest printer offerings at a discounted price. Updating your printers before they break will future-proof your business and give you access to important and updated features that older models lack. The programme works as a upfront discount applicable against selected industrial, desktop and mobile printers (ZT200, ZT510, ZT600, ZT400, GK, GX, ZD420, ZD500, ZD600, ZQ300, ZQ500). Any thermal printer from any vendor can be used in the trade-up programme, it simply needs to be 1:1 type matching. This means that you can trade any thermal industrial printer for Zebra's latest industrial models or any thermal desktop printer for Zebra's latest desktop models - the programme offering large discounts against sale price. Zebra aren't looking for you to send your old printer back - just to agree to it being removed from use within 30 days of receiving your new and updated discounted printer. This offer is only available in EU countries (in addition to Switzerland, Norway and Iceland) and can't be combined with any other discount. If you're interested in upgrading your thermal (direct or transfer) printers and would like to save up to 58.5% off of list price Zebra printers, give us a call on 01978 437537.